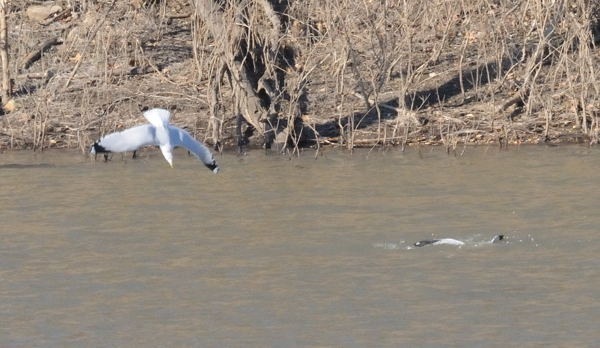 Gulls aren’t what usually comes to mind when I think of Missouri birds. We have lots this time of year though. 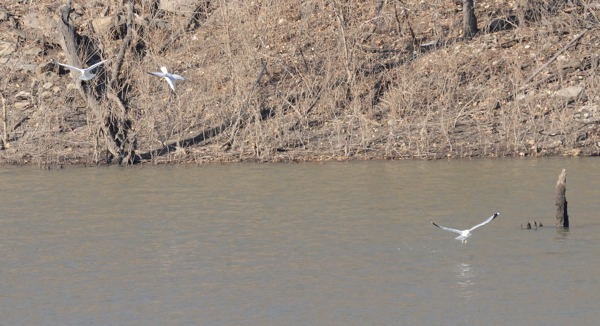 I took a half hour off for birdwatching earlier this week on a return trip from a family visit near Truman Lake, and I found a flock of gulls just waiting to entertain me. Sort of. Actually, I think they were just minding their own business, doing what gulls do, but I was entertained anyway. 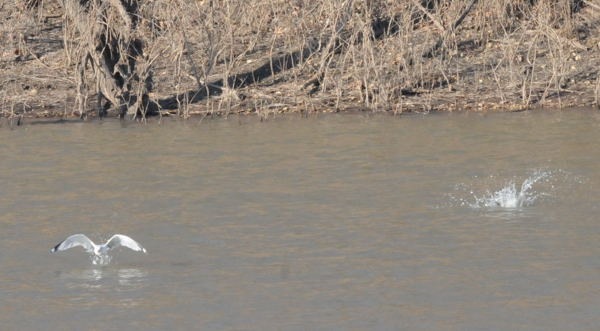 There’s a quiet cove on the south side of the lake where I can usually find some type of water-loving bird. I’ve seen herons, cranes, various ducks and geese, various small shore birds, and of course, gulls. 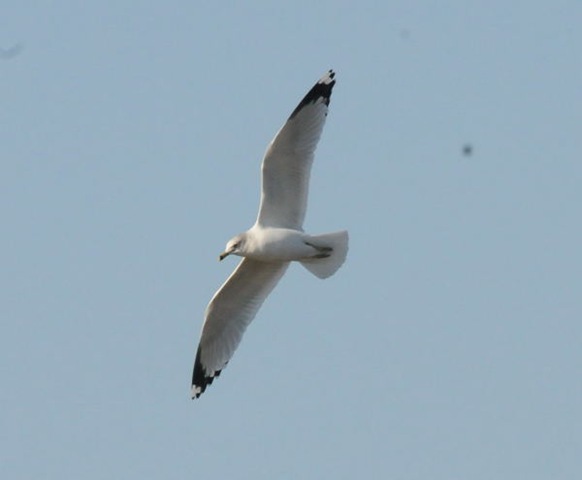 Specifically, that day, I watched ring-billed gulls (Larus delawarensis). They’re winter migrants. 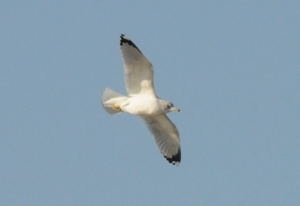 They tend to nest in large colonies on northern lakes. I’ve read that as many as 85,000 pairs nest on a single island on Lake Ontario. There were maybe 85 gulls hanging out on a sandbar near my viewing spot. I guess that’s kind of an island, from a gull’s point of view. They made enough noise that I don’t think I want to find out what 85,000 sound like. Honestly, I can sit and watch birds for hours. They’re fascinating. I love how they move, how their feathers flutter in a gentle breeze and puff up to store warmth on in the bitter cold. I love the odd way they walk and the play of muscle, feather, and balance as they launch themselves into the air. 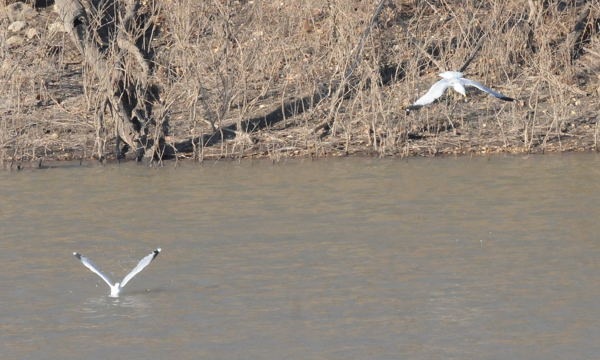 The gulls aren’t so easy to see in this shot — in order from the left, there’s one leaving, one diving downward, and one about to hit the water feet first. 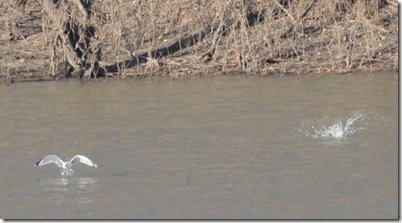 A closer look — I don’t know what the one on the right was after, but it was flopping and splashing around a lot. 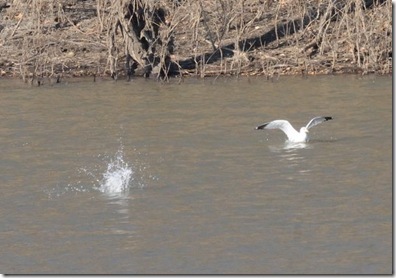 The diver splashes down, beak first. The other one’s trying to take off. . . not so gracefully. 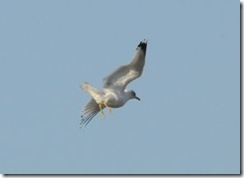 By the time the diver emerged, the graceless one was gone, and another gull was diving at the same spot. Something interesting must have lurked beneath the surface in that spot, because the gulls kept circling back and diving there. The one of the left either ate whatever it dived for or it missed it. 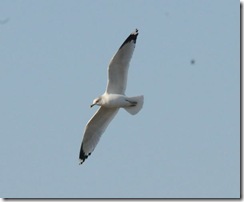 Actually, I didn’t see any of the gulls emerge with anything in their beaks or clenched in their claws. So they must have been gulping down their tiny prey while still under the surface. Or maybe they all missed. 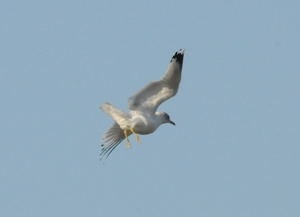 Could gulls be that bad at fishing? Great pictures! You got the one seagull doing a nosedive and even got a picture of the splash when it broke the water. It does make one wonder what they were going after. 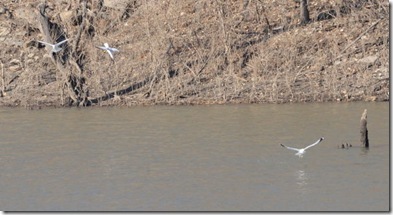 And no, I certainly wouldn’t have thought of gulls when thinking of Missouri. I have learned something else new today. I am very impressed with the article I have just read. I wish the writer of http://www.thelandofmoo.com can continue to provide so much worthwhile information and unforgettable experience to http://www.thelandofmoo.com readers. There is not much to state except the following universal truth: And, nobody gets out of this alive. I will be back.